Disclaimer: I am not a scientist. I found all of my information by zipping all over the internet. If something isn't factually correct (like if I got the year the toothbrush was invented wrong, which I didn't, because I didn't include it) I apologize now. Let's take a journey. Come along with me as we travel from 2006 to the birth of time. Let's see what all this Big Bang theory and evolution hub-bub is really all about. It'll be fun and at the end, refreshments will be served. Today is August 31, 2006. The world has trees, animals, and humans. Technology includes computers, cell phones, jet planes, nuclear energy and weapons, and everyone loves lasers. There are about 6 billion people walking around earth. Look around you if you want examples of what kind of progression we are up to. I see cloning and computers as small as cells. 37 Years Ago. July 21, 1969. Man walks on the moon. Compared to 2006, that isn't really a big deal. We have a freaking space station orbiting the planet now. Technology includes the invention of the bar-code scanner, the ATM, and the artificial heart. 171 Years Ago. 1835. A ton of stuff has happened between 1969 and 1835. From a technological standpoint- the mechanical calculator is invented and the wrench gets a patent. Seems like a LOT of progression from 1835 to 1969 and even more from 1969 to 2006. There are about 1 billion people roaming the planet now. 246 Years Ago. 1760. Ah, the Industrial Revolution. Steam power. Coal for fuel. Powered machinery! All metal machine tools start to appear. Europe is on the rise! 2005 Years Ago. Year 1. 150 Million people are alive. Five Billion Eight Hundred Fifty Million less then 2006. There are 40 times less people in the world then in 2006. It's the Roman Period. Rome is seriously not dealing well with its period. Headaches, cramps, and major bloating. Aqueducts are a big deal now. While Rome is the bill deal in the world, there are other humans sneaking around. In North America tribes are using duck decoys in Nevada. Cultures are walking around Central America defacing property with things like 7.16.6.16.18 which is September 3, 32 BCE in old Mexico talk. Back over near Australia, trade routes are set up between New Guinea and Southeast Asia. In Central and North Asia you have the Parthian Empire and the Han Empire. Looks like a lot of the world is kind of primitive in technology. Those Romans seem to be leading that pack. Humans are scattered all over the word. 3005 Years Ago. 1000 BCE- Pottery is cool in North America. Ceramics and figurines are hot in Central America. The Iron Age is heading up in the Mid East. Bronze is cool but Iron Rules. Up Western and Central Europe cremation takes preference over burial. Maybe it had something to do with religion. The Jewish year is about 2,761. 4000 Years Ago. 2000 BCE. Jewish Year 1766. Egyptians are writing about military campaigns. Small tools and spear weights are appearing by North American people. Wood, Ivory and Bronze are used to make beds a little South of Egypt in the Sudan. Australia is depicting animals and humans showing their innards- its called X-Ray style. It is the writing on the wall. The patriarch Abraham is born almost 4000 years ago in 1813 BCE according to the bible. Other dating has him being born in 2166 BCE. Regardless, is it about 4000 years ago. 4837 Years Ago. 2831 BCE. Jewish Year 899. There is flourishing trade with the Egyptian kingdom. Wood, silver, smelly oils are going every which way. In North America we have bird decoys, baskets, feather work, and skin blankets. South Americans are trying to work out trades for coca leaves. Atlantic Europe and British Isles make distinctive shaped vessels. They are buried in tombs that seem to belong to warriors with greater mobility and stronger acquisitive impulse than their ancestors. Adam, from the bible died this year. 5767 Years Ago. 3760 BCE. Jewish Year 1. Farmers in Israel and Jordan begin cultivating olives and dates. Herders start to use milk. In Japan the people are using pits for storage. Scandinavians produce pottery, pointed bottom pots, fish traps, and yarns. There are people all over the world. The Torah says this is when Adam and Eve were born. 6,500 Years Ago. Two rice varieties are domesticated. One Asian, one African. 10,000 Years Ago. The last continental region, the tip of South America is inhabited by humans. Japan creates the world's earliest pottery. In the Mid East they are using clay and plaster to make statues. Humans are STILL all over the world. According to the Torah, humanity won't receive the Torah for another 7,000 years. 11,000 Years Ago. There are about 5 million people on earth. We say goodbye to the Woolly Mammoth. Jericho has a stone tower about 30 feet. Textiles are produced in Nahal Hemar of linen and blue-dyed fabric with beads and shells. I think we are getting the point here about Humans being around for a long time. We aren't talking about millions of years of dating here, just a few thousand. Lets jump a little bit, shall we? 12,000 to 100,000 Years Ago. Homo floresiensis lived. They are like hobbits. They died out. A line of human evolution that didn't make it. 250,000 Years Ago. Homo sapiens- Humans as we know it appear. Neanderthals are also around- they didn't make it either. There is debate if Neanderthals were another line of human evolution or two separate species. The big thing for them were tools. 1,800,000 to 1,250,000 Years Ago. Homo Erectus Technological Achievement: Tools. 2,400,000 to 1,500,000 Years Ago. Homo Habilis. 6,000,000 Years Ago. The last human associated with chimps exists. 65,000,0000 to 6,000,000 Years Ago. The animals left after an asteroid hit earth traveled along their evolutionary journey. Mostly Mammals and Birds continued on. Through Mutation, Migration, Genetic drift, and Natural selection Humans came about. 65,010,000 Years Ago. The earths conditions calm down to what the resemble today. 65,000,000 Years Ago. A big Asteroid hits earth. 50% of all species are wiped out. The Asteroid hits earth causing a massive reaction. The atmosphere fills with tons of dust blocking out the sun. Waves covered tremendous amounts of lands. Dinosaurs are gone. 180,000,000 Years Ago. Pangaea, a land mass of all of today's continents started to break apart. 200,000,000 Years Ago. A Mass extinction occurred. 20% of marine families got wiped out. 251,000,000 Years Ago. A Mass extinction occurred wiping out 96% of all marine species and 70% of terrestrial vertebrate. It lasted less then 1 million years. This is some heavy stuff. After this, fungal species were the primary keepers of Earth. 360,000,000 Years Ago. A mass extinction knocks out 70% of species. 444,000,000 Years Ago. 100 Marine families become extinct. Wingless insects are seen. Throughout the millions of years of mass extinctions, animals are changing, adapting and evolving. 505,000,000 Years Ago. The first fish. 600,000,000 Years Ago. Sponges and multicellular animals. 780,000,000 to 580,000,000 Years Ago. Ice Age that freezes over earth. 900,000,000 Years Ago. There are 18 hours a day and 481 days in the year. Earths rotation started slowing down. There where over 100 extra shopping days for Christmas and the work day was only from 11 to 3. choanoflagellates developed. They are the ancestors for the entire animal kingdom. 1,000,000,000 Years Ago. Ok. Now it is a BILLION years before 2006. It's going to be a very long time before I am able to blog any of this. Multicellular organisms appear: initially colonial algae, and later seaweeds, living in the oceans. Let's jump again. We get the point. The earth and its little organisms went through puberty. 4,600,000,000 Years Ago. The planet Earth forms from the accretion disc revolving around the young Sun. Our solar system was formed from a Solar Nebula along with our Sun. 13,700,000,000 Years Ago. The universe is formed. The Big Bang theory is that we suggest that the Universe is always expanding based on Hubble's Law. Hubble saw light red-shifting which suggests the universe is currently expanding. The entire universe is moving uniformly- things farther away are moving away faster- showing the expanding universe. The universe is expanding from an origin. A hot dense origin. This thing exploded and since then the universe is expanding. Not only was the universe created at this point, but time was as well. Beyond 13,700,000,000 Years Ago there was nothing. I am not a scientist. I have trouble wrapping my head around that idea that the universe is infinite, but I accept it. I also accept it when they tell me that before the big bang there was nothing. But, if you don't- check out this article by Paul Davies entitled, What Happened Before the Big Bang? And this is where our little tour ends. Thank you for not throwing your beverages at the screen and please take your trash with you when leaving. Adios. -People who are ignorant about his topic tend to brush it aside with the words: "Science is always changing. Come on, what do they know". I ask those people to please, open a book. -The earth was inhabited by millions of people when the bible said Adam was "born". -It is possible that during the time the Torah says Noah's existed there was a climate issue or flood in that region. -The earth went through a lot of Sh*t that has nothing to do with trying to prove or disprove God. Science seeks truth, not disprove God. -On Friday, April 13, 2029 an asteroid will come extremely close to earth. It was thought that it would hit us, but later research dictates it will miss us. -To the people who say carbon dating is flawed so you can't be certain of history millions of years ago. I don't need to, just 6 thousand. If millions of people and all of their crap is found before God said Adam was "born", you got an issue with the Torah literally buddy. -To all the people who say God created this world as is, ready to go- That means he created it with millions of live humans. It's good to know that God made the first man, Adam, some poker buddies. -Humans are evolving as we speak. We are smarter now then we were two thousand years ago when the Talmud was written (not that we have the same access to material they did 2000 years ago). -Microsoft Word doesn't like the word "Multicellular" and wants to spell-check it to "Multicultural"
-Quantum Physics is the most freaking cool thing in the world. "Mostly, quantum events occur at the atomic level; we don't experience them in daily life. On the scale of atoms and molecules, the usual commonsense rules of cause and effect are suspended. The rule of law is replaced by a sort of anarchy or chaos, and things happen spontaneously-for no particular reason. Particles of matter may simply pop into existence without warning, and then equally abruptly disappear again. Or a particle in one place may suddenly materialize in another place, or reverse its direction of motion. Again, these are real effects occurring on an atomic scale, and they can be demonstrated experimentally." George Allen says "people" don't care about his macaca remark. Is this a little bit like when Clinton said that "people" didn't care about the extra ciricular activities he enjoyed, in private, with Ms. Lewinsky's full consent? Well, no, not at all. When Clinton said it, he was right; the people, in fact, did not care. Anyway, Clinton's piccadillo had no victim, while Allen has offended "macacas" everywhere. At least 43 people have been killed and 112 wounded in a series of rocket and bomb attacks in Baghdad, the BBC reports. Glad to see the new, new and improved security crackdown is having an effect on the civil war that isn't happening. In a stunning example of affirmative-action for conservative Jewish bloggers, DovBear has graced me with the opportunity to guest post at his popular blog. Who said that DB doesn't tolerate diversity? Now if only colleges and law schools would do this as well when hiring professors; it's far more important to create academic than racial diversity. In my quest for truth, I decided to write a list of all the fundamental things we know for sure about God, Judaism and Religion in general. Here it is. Please let me know if I missed anything off the list. 1. Homo Sapiens (mostly) have a sense of spirituality (that there’s something out there greater than us). In various times and places, this has been translated into beliefs about various types of god or gods. (see http://www.lowchensaustralia.com/names/gods.htm for a partial list). 2. Homo Sapiens have cognitive problems with visualizing or accepting certain concepts: These include: Infinite chains of regress, things happening with no prior cause, more than 3 dimensions of space/time, and many others. In order to explain the things we cannot explain by reason and evidence, Homo Sapiens often turn to fantasy and imagination. 3. Homo Sapiens have created many hundreds of thousands of religions and sects over the last ten thousand years (and many before that too). 4. There is currently not one single piece of good evidence for any god, gods, spiritual entity or anything at all of that nature. 5. Billions of people throughout the world all passionately believe that their personal religion is the ‘one true religion’, and that all the other religions are patently false. These beliefs are based on faith, not reason or evidence. 6. Due to the fact that billions of people all believe in contradictory beliefs via ‘faith’, the only logical conclusion here is that ‘faith’ is an entirely unreliable methodology to produce truth. 7. Homo Sapiens also usually require meaning in life, motivation to be good and moral guidance. Religions provide this in good measure. No other realm of human activity (with the possible exception of some philosophy) provides this as well as religion. 8. The Jewish people have had an incredible history and have also had a major influence on western (and even global) civilization. 9. The Jewish religion is a very varied and rich religion. In common with all other religions, its adherents like practicing it. Shorter Bill O'Reilly: "Whah! Why won't those stupid losers let me join their crappy club for jerks?" of smug, self-satisfied showbiz types parading their liberal views in front of an adoring Los Angeles audience. This is very different, you understand, from what Bill does all day, everyday, on TV, radio, and in print. Bill never parades his smug, self satisfied views in front of adoring audiences. Ne-vah! My pal Jon Stewart and his legion of writers think they’re ultra cool and hip because they embrace every left-wing cause that comes down the pike. Yeah, you won, Stewart, but the fix was in. The choir to whom you preach runs the Emmy Award program and every other Hollywood smoochfest. You guys can be funny, but how many Americans want you people standing between them and Iran? Maybe Larry David, but that’s it. I see. And how many Americans want Bill O’Reilly standing between us and Iran? Ye, gods. We haven't even hit September yet, and already the veiled death threats have begun. One can only imagine the fever pitch this will escalate to by November. Should we start some sort of death pool to predict when Sean Hannity's head will explode on air? Anyway, memo to Sean: You're done. Finished. Kaput. Your time is over. You've had a good run, causing great harm to our country, and creating a devisive, partisan political atmosphere, but it's over. We're taking the country back from the con job fraud people like you and pill-popper Limbaugh have perpetrated. As we have established, Orthodox Judaism requires a great deal of faith to believe in it. One could make quite cogent arguments for Reconstructionist Judaism, or even a secular lifestyle, as opposed to Orthodox Judaism. For example, Sam Harris, in his book ‘The End of Faith’ argues that all fundamentalist (and even many liberal) religions are evil. You don’t necessarily have to agree with that, but clearly there are people who do. This being the case, in as much as the Orthodox world conducts ‘kiruv’ to try and persuade non-Orthodox people to become Orthodox, it would seem to be equally fair and appropriate for those in the non-Orthodox world to conduct ‘kiruv’ to try and persuade Orthodox people to become non-Orthodox. In fact, if Sam Harris is right, it would even be a mitzvah to do so. Yet few such organizations exist, and those that do, tend to provide after-the-fact ‘support’ for those who have strayed, rather than engaging in active ‘outreach’. It seems that society accepts ‘kiruv’ (whether Jewish, Christian or otherwise), as long as you are trying to persuade secular or non-affiliated people to become more affiliated. However trying to persuade religious people to be less religious, or trying to get affiliated people to switch religions (e.g. Jews for Jesus proselytizing) is not accepted. I wonder why? What do we do if it turns out God's a monster? I mean what if after 120 we discover the extreme Haredi/RW Zionist conception of God is true, that he's basicly this overlarge sky demon who likes watching us do bizarre things. It's not impossible. I can conceive of a 7 year old tormenting smaller, stupider, weaker creatures with absurd demads. Why not extend the analogy? Why couldn't God be a brute, but a benevelont brute who took us out of Egypt and as payment wishes for us to keep our meat and milk seperate (which I do, religiously) and slaughter Arabs (which I don't do, religiously or otherwise) and all the rest? Maybe the extreme Hasidim are correct about God wanting men to avoid woman and secular wisdom they way other men might avoid the plague. Maybe God wants us to devote oursleves to a life of wearing fur hats and white socks. Maybe the sight of all those little people dressed in black, singing songs and eating kugel makes the creator happy, in the way it pleases my son to see the residents of his ant farm scurry about. Maybe the extreme non-Hasidic Haredim are right to be hostile toward science. Perhaps it's all a test, and the non-benevolent Trickster God did bury all those dinasaur bones, and fiddle with the carbon levels just so he could see for sure if we loved Him or not. Maybe the extreme religious Zionists are right about Arabs. Perhaps we are supposed to be stacking their bodies like cordwood, and razing their villages and orchards so that the next generation of Kachniks have a place for their trailers and target shooting. If any of them are right, it means the Rambam was wrong, and that his rationalist conception of God and the Law was about as accurate as his views on medicine. It would mean that those less extreme Haredim, and Modern Orthodox Jews who believe that the Torah was given to us only for our own benefit, have half the picture. But the theory fits a lot of what chazal said about God. It even fits a lot of what God said about himself in the Torah. Oh dear. 50 and up: Jewier than Moses. Feel free to approach and ask "efsher you can help with a mincha minyan?" 10-50: Definitely Jewish. He may pass for a goy to those without your sense of J-Dar, but this guy definitely enjoys his chulent and single malt on shabbos. -10-10: Possible Jewish. You can ask, but leave out the Hebrew and have a silk yarmulke in the pocket just in case. Be prepared for the quizzical stare in response. -10 and under: Definitely a Goy. The only way this gay is Jewish isif he is Jesus himself. Thinks kosher has something to do with pastrami on rye and hot dogs. He's running for president. He's a mainstream Republican. And he's a racist. 1 - He publicly mocked S.R. Sidarth, a young Indian-American staff member for his Democratic opponent, as a"macaca." And though Allen says, he made a mistake, his apologies are lame. He looked directly at that young man and insulted him twice. This was in your face stuff and not just an unfortunate incident. 3 - During High School, which he attended in Southern California, Allen drove around with a Confederate flag on his Mustang and posed for his formal yearbook picture wearing a Confederate flag pin. 4 - A confederate flag can be seen in the background of the very first ad Allen ran, when he ran for governor in 1993. I presume this was intended as some kind of signal to angry white Republicans, on the order of Ronald Reagan delivering his first major campaign speech in Philadelphia, Mississippi, where three civil rights workers were murdered in one of the 1960s' ugliest cases of racist violence. Reagen's speech, incidently, was a ringing declaration of his support for "states' rights" — a code word for resistance to black advances clearly understood by white Southern voters. 5 - And now a photo has surfaced of Allen posed alongside three men from the Council of Conservative Citizens (CCC), the racist and anti-Semitic organization formed in the 1950s and dedicated to preserving segregation in the South. Republicans, are you ready to throw this guy overboard? Senate Majority Leader Bill Frist did not meet all the requirements to keep his medical license active, even though he gave paperwork to Tennessee officials indicating that he had, his office acknowledged Tuesday. You mean they don't renew medical licenses for doctors who do video diagnoses? Recently I attended two of Rabbi Natan Slifkins lectures. The first one I heard was "The Animal Kingdom in Jewish Thought". It was a lecture about the relationship Jews should have with animals. The lectures are to help promote books and the book corresponding to this lecture is "Man and Beast" which he was pimping nicely. Rabbi Slifkin mentioned a few animals in tanach. He explained that the reason the Tzvi is commonly translated to deer is because in Europe, where most translations and explanations occurred, the closest thing resembling the description of a Tzvi was a deer. A Tzvi actually is a gazelle. He continued with the differentiation of man and animal and the approach that Jews should take to animals. Rabbi Slifkin explained about how some organizations and activists feel that animals are equal to humans and how completely incorrect this is. Other ideas touched on were eating animals, hunting animals, wearing animals, medical research, etc. Rabbi Slifkin said that in regard to harming animals for human benefit, the benefit should outweigh the pain. For example: If hurting a monkey might find a cure for cancer, then we are saddened to pain the monkey but understand that result could be much more beneficial to the world. The major point of the lecture was that animals have their place in this world (food, for example). They should be respected for what they are. Above all else: The distinction of Jewish attitude towards animals. Instead of being kind to animals for the sake of the animal, Jews should be kind to animals because we are kind people within ourselves. The second lecture was entitled "The Terror of Dinosaurs". It was a lecture that mirrored his book, "The Challenge of Creation". He started off by passing around pieces of dinosaur history millions of years old. Passed to me was an old egg shell. It was a very old egg shell (millions of years old). The point of the display was to show that dinosaurs existed. Once he showed they existed, he needed to explain two big problems: 1- Science tells us that dinosaurs lived millions of years ago while the Torah says the Earth was created only 5,767 years ago. 2- Dinosaurs aren't mentioned in the Torah, what gives? In order to prove that the earth is billions of year's old, dinosaurs are millions of years old, he first addressed the apparent contradiction with the Torahs 5,767 years of Earth. To do this, he took each common answer that tries to make Torah and Science mesh and explains why it is not a satisfactory answer. I got to see an entire room of people watch the six days of creation get thrown way up in the air and blown away with a bazooka. The world, our world, is billions of year's old- end of story. The dinosaurs aren't included in the Torah because there is no reason to include them. We can learn things about their existence but they have no relevance in the torah. The big point of this lecture was that: The Torah is not a book of history or science. It is a book of Theology. I know I am being vague and I am reluctant to say any more because I think people should throw a buck his way to get his book or get him to lecture. My overall thoughts on the lectures: They were spiced well with humor. His progression of topics and outline was good. His accent seems to be bastardized British. The material is needed to be said and spread. As a speaker: a 6 or 7 of 10. I was very pleased with the lectures. They were well thought out and enjoyable. I would recommend him to a friend. All sorts of delicious DovBear has recently been added to the sidebar We (by which I mean me) think it's exactly the sort of creamy, macaroni and cheese like material you'll find at once comforting and familair. For your convinience, I've put it in the body of this post, as well. Please feel free to click generously. If there's a post from the past you'd like to see added to this list, by all means tell me. And, if you have a comment about any of what you find below, please put it on this post's thread. Well if the Bear hasn't given me the boot yet then I'll take advantage and get back up on the soap box one more time. Several years ago I was asked (by someone I respect and owe many favors to) if I would help out a yeshiva in Lakewood with some web-related work. There are certain government programs that one can only interface with through the web and the Yeshiva did not have internet access in their offices so I said I would help out. Of course no good deed goes unpunished and I am now frequently called by this yeshiva (and others!) who not only ask me to fill out government forms on line but have all kinds of questions about these government services and policies. I have told them MANY times that I have no expertise navigating these legal/governmental issues but somehow (perhaps because I can READ) I've gained a reputation as some kind of expert. I've always been mildly annoyed by the increasing imposition these schools have been making on my time but I felt sorry for the students suffering at the hands of an inept administration. The Yeshiva has never offered me any kind of compensation and never even pay me back for postage, although I was recently informed that I merited some of the s'char earned by a particular Yeshiva boy who's paperwork I finished at 11:30PM last Thursday night. According to Lakewood the internet is trief! Sure the Lakewood internet ban is old news but it's still in place as far as I know. While I don't live in Lakewood I am still a frum Jew and the Roshe Yeshiva, bochrim, and secretaries that call me for help all know that. So what does that make me? Some kind of Jewish Shabbos goy? Am I granted special internet filtering magic powers in exchange for my helping the yeshiva or is my neshama so far gone that a little more evil couldn't possibly make things worse. So... should I quit? If so how?! If quiting isn't possible maybe I could at least have some fun with this - all suggestions will be considered. The next time you are at a wedding sitting through another horrible rendition of Pacobel's Canon, think of this instead. Warning: If you are a a resident of Lakewood, watching this video of a guy playing Pacobel's Canon on the electric guitar is a FLAGRANT VIOLATION of the Internet fatwa!!! As penance, go burn some library books, but don't go inside the library itself, that's assur too. I had a hard time deciding what to call this post. My first thought was “A Passionate Yearning for Zoboomafoostan”, but decided to leave that for my reply to XGH. Keeping your mantra in mind of “trying to run an interesting blog”, I decided the best way to reply to your excellent fisking of my Eretz Yisrael posting would be a personalized letter to you instead of starting a fiskathon. By excellent, I mean that in terms of blogging standards, you definitely win high marks for style, diction, iambic pentameter and spelling – it was entertaining to read, yet I think you missed the point…which is why I’m writing this. 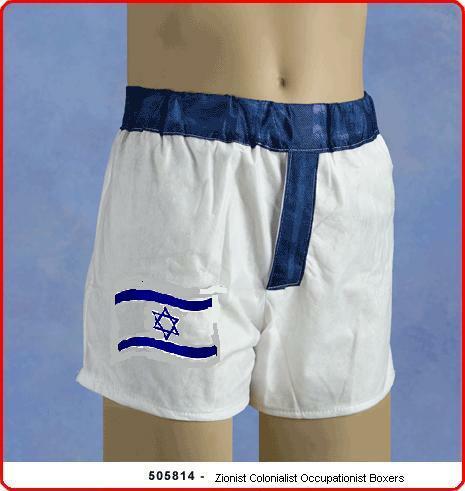 Most importantly, it should be obvious to all, that using blue and white underwear as a statement of one’s allegiance (or not) to the Zionist “nation-state” entity, cannot possibly be construed as anything but a joke, regardless of being said by you, myself, or others. However, you seem to have me all wrong. Not once in my posting did I write anything about “Zionism”…the passion I wrote about was for the land of Israel…and that there’s a glass that’s two-third’s full when it comes to the Judaism of the people living here. One doesn’t have to be a “Zionist” to live in Israel, or have the passion for the land and it’s people. You don’t have to be a “Zionist” at all to appreciate where we are now…just look at the Jewish people over the past two thousand years and compare it to now to see what great shape we’re in! When you wrote that had Rav Yehuda HaLevi been able to see the future creation of the nation-state in 1948, he probably would have been disappointed – how do you think Moshe Rabbeinu viewed the Jewish people when they left Egypt? I would bet that the Jews leaving Egypt highly resembled a scene from the central bus station of Tel-Aviv. Exile does have it’s problems for a Jew’s spiritual health – be it Egypt or Babylon or Budapest or Boropark -- and it will take time to revitalize the Jewish people in Israel to the realization of proper observance. I’ll even let you in on a secret – I didn’t really grow up waving an Israeli flag. The yeshivot I went to for junior-high and high school never said Hallel on Yom Haatzmaut, (they said tachanun), they never sang Hatikva, and they didn’t plant JNF trees either. I don’t even know what sort of “Zionist spark” you thought I was looking for you to find – I wanted to provoke, prod, goad, encourage you to write about Israel, (be it the land, Jerusalem, the nation-state, Zionism, or anything in-between). On a serious note, G-d forbid that I may have inadvertently implied that only the 2 groups I mentioned before are dedicated and fierce fighting soldiers – there are many great soldiers fighting for Israel’s defense from many parts of the country. However, in the last 2 weeks of the war, many articles were written in the Israeli press, many radio stations discussed the issue (I heard Razi Barkai discuss it on 3 different occasions on IDF radio) – that there is a disproportionate amount of representation of kibbutznikim/moshvanikim and religious-nationalists in combat units, and that a minimum of 40% of the IDF combat officer’s courses, are kippa wearing soldiers. Manpower Division commander, Elazar Stern also reported this in the media, and got a lot of flak for saying that Tel-Aviv had very little representation in combat units. Those are the statistics from the IDF, not from me. (And I apologize, if anyone understood otherwise – and I thank every soldier who serves in the IDF, defending the country so that Jews can live in Israel). The points I raised were about the unity that was evident over the past month during the war. The volunteerism I wrote about was NOT the conscripted soldiers (though I know many soldiers who volunteered to fight in Lebanon without waiting for a tzav-shmoneh), but about the volunteerism of Magen David Adom emergency service or all those who don't have to volunteer but still went up North, and helped out. Those who baked and cooked for volunteers or for those less fortunate who didn't have enough. Those who went from bomb shelter to bomb shelter to offer food and aid to elderly, and puppet shows for kids. Those who put up "strangers" from the North in their homes. Lots and lots of chessed. And seeing it all -- experiencing it all was very special, and Jews from all around the world "felt something" and wanted to help as well. Admit it. You love Israel even with all it's problems -- you wouldn't bother writing about it otherwise. And regarding Judaism in Israel -- it's like the pit that Yosef's brothers threw him into. Rashi says it was "empty and had no water in it", and the redundancy teaches us it was full of snakes and scorpions -- nature abhors a vacuum. If Jews don't move to Israel and fill it with Torah, morality and justice -- then it will be filled with other less desirable things. As this Elul starts -- I just wanted to wish you a happy, healthy and prosperous year. And I hope you forgive me for anything I may have written that insulted or annoyed you (except for the blue and white underwear line). PS: I was taught about Manifest Destiny in High School, and even though our secular studies department was less than stellar, we did have an excellent History teacher -- the head of the History from a nearby university (he decided that his contribution to Judaism was to teach us). His take on Manifest Destiny was that it was an expression of religion. ...flogging the deadest of dead horses [Instapundit's Glenn] Reynolds has a post totuting an idiotic WaPo story ) which compares death rates of American soldiers in Iraq to the death rate of the American population, and finds that it's only half--apparently it's like a gated suburb! Surely, you say, the Post must have at least taken death rates for the age segment of the population most likely to serve in the military? I'm afraid not--it really does compare the population as a whole to the frequency of much younger soldiers dying in Iraq. An intellectually honest five year-old could see the utter uselessness of the comparison. Reynolds, conversely, crows that "it's hard to look at these numbers and see the catastrophe that the "527 media" are proclaiming." Have you also noticed that some on the right are doing their best to make Iraq look like less than the debacle it is? Little sick, that. But I'm surprised to see the solidly liberal Post carrying water for them.... unless... is it possible that their really is no monolithic liberal press? Hmmmm. In any event, public opinion is solidly against the war. Attempting to convey that life in a war zone is no more dangerous than living in a quiet American neighborhood suggests that -wherever their scribblign appear - the idiots are panicking, and running around with their hair on fire. The grass is blue. Hahahaha! I was right. The grass is blue! Ann Coulter's new book Godless: The Church of Liberalism is a rollicking read very tightly reasoned and hard to argue with. After all, the progressive mind regards it as backward and primitive to let religion determine every aspect of your life, but takes it as advanced and enlightened to have the state determine every aspect of your life. Lest you doubt the left's pieties are now a religion, try this experiment: go up to an environmental activist and say "Hey, how about that ozone hole closing up?" or "Wow! The global warming peaked in 1998 and it's been getting cooler for almost a decade. Isn't that great?" and then look at the faces. As with all millenarian doomsday cults, good news is a bummer." Sigh. Isn't it amazing how Coulter lies, and then Steyn swears to it? Actually, I think very few even in this Bush administration really believe we are not causing global warming . It's just a combination of greed and indifference that lead them to continue to lie. There's money to be made, you see. So, in hopes of earning an invitation to the next shindig, I'm doing my part to clear Karben's name by exploring a new, unsubstantiated rumor about the real reason for Karben's departure from the Assembly. His mother, Shelly Karben, is one of the people deeply involved in the Tendler inbroiglio. She was sued by the disgraced Rabbi for interfering with the Rabbi's contracts, and it appears she was part of the group that tried to force the Rabbi out of his pulpit. Shelly Silver, the Orthodox Jewish leader of the NY Assembly, could have backed Karben up in any number of ways when news of Karben's picadiloes became public. But, instead Silver fed Karben to the alligators. The question is: Why? A DovBear star of achievment for the first person to prove a link between Silver and Tendler. PRESIDENT BUSH travels to the Gulf Coast this week, ostensibly to mark the first anniversary of Hurricane Katrina. Everyone knows his real mission: to try to make us forget the first anniversary of the downfall of his presidency. As they used to say in the French Quarter, bonne chance! The ineptitude bared by the storm — no planning for a widely predicted catastrophe, no attempt to secure a city besieged by looting, no strategy for anything except spin — is indelible. New Orleans was Iraq redux with an all-American cast. The discrepancy between Mr. Bush’s “heckuva job” shtick and the reality on the ground induced a Cronkite-in-Vietnam epiphany for news anchors. At long last they and the country demanded answers to the questions about the administration’s competence that had been soft-pedaled two years earlier when the war first went south. A year after the storm, the reconstruction of New Orleans echoes our reconstruction of Baghdad. A “truth squad” of House Democrats has cataloged the “waste, fraud, abuse or mismanagement” in $8.75 billion worth of contracts, most of which were awarded noncompetitively. Isn't it interesting that Alberto Gonzales is able to spy on private citizens to his heart's content but can't seem to follow the money trail when it involves fat cat contributors to the Repug party? (1) Please note the new index on the right-hand sidebar. Your thought and comments are welcome. (2) The time has come to vote some of our contributors off the DovBear island. (not permanently; I expect to bring everyone back in the fullness of time.) Again, your thoughts and comments are welcome. (3) Confidential to Joe: I didn't respond to your comment about the Jewish professors from Texas, not because I had been brought up sharply, as you imagined, but because I thought your remark was mindnumbingly stupid. As Nick said, these professors aren't anti-Semites, nor are they self hating Jews. They are simply expressing an opinion about how to end the violence in the middle-east, an opinion that is, in fact, in vouge among certain left leaning Israelis. I may not agree with each and every one of their prescriptions and suggestions (in fact, I don't), but I appreciate their sentiments and see no malice in their letter and nothing sinister about it. Sunday, the New York Times ran an article about the Satmar of Kiryas Joel which was gentle and generous. In fact, the paper described the tension in Orange Country between the Hasidim and their neighbors with the same sort of blase equanimity which critics of the paper's Israel coverage find so maddenening. No mention was made of the semi-legal mechanations the Satmar have employed in pursuit of expansion. Very little was said about KJ's relentless pursuit of political ends, like its much-reviled attempt to get the state to pay for a public school system for its disabled students, or it's efforts to build a pipeline to tap into the New York City water supply. There were a few words about the village's plans to expand and annex land, but it was the county residents who worry that the Hasidic expansion will change the tenor of their town who came off looking suspicious and resentful. I bring this up specifically because Yaakov Menken has recently informed me, via email, that only a simpleton would say that the media is kind to ultra-Orthodox Jews. Dear Yaakov, had the Times wished ill upon Satmar of Kiryas Joel, there are many unpleasent truths their reporter might have told. Instead, the story was written up as a simple dispute between neighbors; some of whom prefer farms and open spaces, and others who prefer sidewalks and children. And as I read it, the neighbors got the worst of it. Here’s another post which criticizes Cross-Currents. Why bother? Because Cross-Currents censor comments, and therefore thois is the only option. “In our community there are thousands of Perelmans. There are indeed thousands of problems as fascinating and intractable as Poincaré’s. Some are in the Rambam, some in the Ketzos, some in R’ Akiva Eiger. There are no Fields Medals awarded to those who work on them, and often produce results of stunning elegance. Unlike Perelman, these people pursue knowledge monomaniacally, but manage to raise beautiful families at the same time. Like Perelman, they spurn many of the comforts that others take for granted, and find satisfaction in knowledge itself. For the most part, their pursuits are non-competitive, and delight if they can offer a piece to a solution that others will complete. Like Perelman, they are often misunderstood and under-appreciated, even mocked by others. Sorry RYA, but there’s a huge difference. Problems in the Ketzos might be beautiful and fascinating, but solving them won’t bring about any measurable benefit to the world. Possibly solving Poincare might not either, but in general the field of mathematics is absolutely integral and in many cases fundamental to the entire fields of physics, chemistry and so on. In fact it is quite an object of amazement that mathematics should be like this, and a recent Torah & Science book even uses this fact as an ‘emunah booster’. So while the world’s mathematicians toil away in obscurity, advancing the field, and enabling advances in other sciences, which in turn enable advances in medicine and other life enhancing technologies, our best and brightest spend all day solving problems in the ketzos, and achieving nothing of any measurable value. Of course you can always have faith that God wants us to spend our time that way, but then the analogy hardly holds, does it? Greetings, Bearlings. I am flattered and honored to be a guest blogger here at Dov Bear. For my first guest post, I'd like to share this unbelievable dating story I heard from the woman in question at a Shabbat meal yesterday in Jerusalem . . .
Shevua Tov! 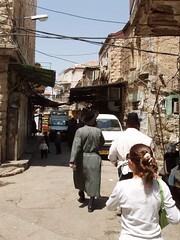 Several weeks ago, there were a few postings here on DB about a reported 'attack' on tourists or missionaries in Meah Shearim, a UO area of Jerusalem. These poor tourists just stumbled in to the area and were mercilessly attacked by the overzealous closed minded residents. Or, these missionnaries targeted the area, made significant effort to get in to the area, and were forceably asked to leave when handing out missionary material to youth. 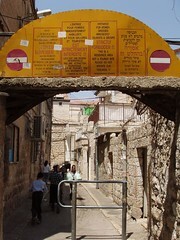 The sign at the right reads, in 4 languages, "Entrance for Women Dressed Immodestly, Tourists and Groups STRICTLY FORBIDDEN!! This is a residence area, not a tourist site. Please do not irritate our feelings! - Neighborhood Council"
So, seeing the pictures to the right, do you think residents of an area have a right to set standards within their area? All these people ask is to not be a tourist attraction and for people entering their neighborhood to adhere to not unreasonable standards of dress (say minimum dress standard, 'business casual', though they probably wouldn't use that terminology). Click pictures for larger image. Published from Israel, +10 hours from blog time, this post is Shomer Shabbos. 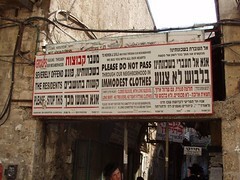 The last picture was seen in a womens clothing store with women shopkeepers in Geulah, a little more open area than Meah Shearim. Dr. Mike S. Adams, Ph.D is a moron. He writes for Clownhall, so perhaps that's a redundancy; still, I'm singling him out for my particular brand of ire, after reading that he, in his wisdom, used the slur "self-hating Jews" to describe some of the 27 faculty members University of Texas at Austin who wrote a very polite letter to Condi Rice urging her to work toward a peace settlement between Israel and its enemies. "Self-hating Jew" is a terrible insult, and one that should never be thrown around by a non-Jew like Dr. Miks. We don't need non-Jews inserting themselves into our intramural arguments. It's none of their business. Moreover, why is it self-hating to seek peace? Several times each day we call upon He who creates peace in His celestial heights, to create peace for us and for all Israel. Were the authors of our prayers self-hating Jews, as well? Yeah, with all those snarky, sarcastic comments in every CC post, they’re certainly not humorless. Snarky? Yes. Sarcastic? Yes. But humorless, I guess not. Really? I assume that by ‘Centrist’ the author means ‘Modern Orthodox’. (Is there some reason the author couldn’t write Modern Orthodox? Very strange.) But why is a Hareidi site claiming that KOE and women’s roles therein are of negligible concern? On the contrary, the moves at the far left of MO are of extreme concern to the RW MO, and are of extreme interest in Centrist MO, hence all the hysterical articles on the subject, with the RW desperately claiming that there’s nothing here folks, move along, move along, with the opposite side saying this is the start of something big. The more they protest that there’s nothing doing here, the more it makes me think that there is very definitely something doing here. Clearly, there is nothing black or white about appointing a woman in a leadership role, even in a shul. There's no clear Halachah against it, it's a matter of social policy. And it's always these kind of issues which get the RW so worked up, because all they can do is scream hysterically 'You're a kofer, you're not Orthodox, you're Conservative!' (Kinda like the way I scream at DovBear sometimes). Some people accuse me of hypocricy. They say my old blog, and this blog too, are constantly snarky and sarcastic. That’s maybe true, but then we’re not claiming to be Rabbis trying to present Orthodoxy to the outside world in the best light possible. Most of the CC posters seem to be fairly decent well respected people in real life, (most but not all), however when they get on CC they just get nasty. I think there must be something about blogging, it turns even the nicest people into obnoxious jerks. (Yes, me too). Ironically, reading Cross-Currents just makes ME want to shout out 'I'm not Orthodox, and nor do I want to be!'. Yuch. I think we need a new Cross-Currents. One that IS actually broad minded, one that DOES actually paint a good picture of Orthodoxy, and one that isn't staffed by a bunch of obnoxious jerks (when blogging) continually denigrating every branch of Judaism which isn't exactly like their own. Anyway, I think Yaakov must inhabit an alternate universe. I read the papers, and watch the news, and by my lights the haredim are treated with kid gloves for fear of offending. Where are haredim bashed? He's being needlessly paranoid. The terribly sad thing about the Cross Currents expreiment is that it could have been a good and useful site, had it lived up to its stated ideals. Unfortunatly, many of the posters are too cowardly to tackle legitimate issues (remember the deplorable way they handled Slifkin and the Boro Park riots?) and by giving voice to both Toby Katz and his own worst demons, Yaakov Mencken has created something that, unfortunately, justifies anti-Orthodox bigotry, rather than combating it. I can't tell you who I sent this to, but he's a yeshiva owner/principle/heiliga-admar-rosh yeshiva/Gaon/HaRav who, to my happy surprise, is really a good guy and quite approachable. He reads my blog, and we've developed a warm relationship. Anyway, I've been needling him because I recently discovered that tan pants aren't permitted in his school. He says he's allowed to establish any kind of dress code he likes. And -hey! - what about shorts and tee shirts? Tee shirts aren't respectable; neither are shorts. You couldn't wear either in a courthouse, let's say, or on the floor of Congress. Polo shirts are a little better, but also not really appropriate for nice public places. A good resteraunt wouldn't let you in, and no politician with any self respect would do anything serious in a polo shirt. The president of the United States does the country's business wearing tan, but your yeshiva proscribes it? This is fear of neighbors, not fear of God, because you can satisfactorily express your awe of heaven and your respect for the Torah wearing a nice pair of tan trousers. They are in every way the equal of good pair of black or blue pants. I assume Jameel realizes that Palestinians have a passion for Palestine, Iraqis for Iraq, Kenyans for Kenya, Croatians for Croatia, and so on. Many peoples have a passionate, even mystical attachment to their homeland. This is sometimes hard for us Westerners to grasp (except in the context of Eretz Yisrael), since we tend not to have deep roots in our diaspora countries. But it is true for many peoples, especially deeply rooted cultures. Judaism might be somewhat unique in that the passion survived 2000 years of exile, but then all that passion hasn't really pursuaded millions of very passionately faithful Jews in Europe and the US to actually make Aliyah. 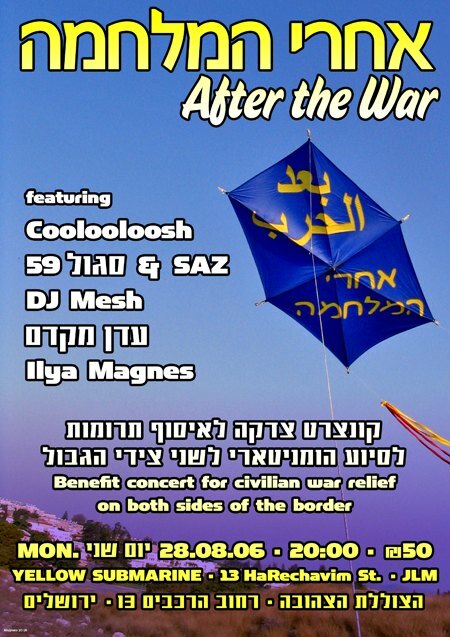 And of course many hundreds of thousands of Israelis have made or would like to make yeridah. I'm afraid this 'passion' is just another example of irrational, emotional faith. I am a lurker on your informative blog, and I thought you might just be the person to answer my question. Yesterday, I was driving through Englewood, New Jersey. Yes, I know it was Shabbos, but becuase I am an official Secular Jew (tm), I have special permission to do so from the God in whom I don't believe. I am led to understand that Englewood has a large population of Orthodox Jews. I was interested in obersving them in their natural habitat, becuase I live in Baltimore, Maryland, a location that also contains large numbers of Orthodox Jews. However, what surprised me was that I observed a young man (of apparently high school age) who was walking down the street wearing a srugi kippa (not too unusual), but also wearing shorts and a polo shirt like some secular yuppie! In addition, he was carrying a backpack! The backpack was less problemmatic to me, because I suspect that Englewood might have an eruv, but the mode of dress seemed to be entirely out of place. Yes, we have Orthodox boys in Baltimore who might wear a polo shirt and jeans during the week, but never shorts. And this was Shabbos! Even if a Baltimore boy wears a srugi instead of a black hat, he's never dress so casually on Shabbos. So this correspondent from the provinces wants to know what's going on? Is this an example of the "modern orthodoxy? that I've heard about? (We have shuls in B-more that are suppposedly "modern Orthodox," but that just means that they are Conservatives that don't like egalitarianism. The real Orthodox shuls are all black-hat. They also tried starting a "modern Orthodox" day school, but it has since reverted to a leftwing UO school where they teach "Ivrit.") Is it really possible for someone to observe the laws of Torah, yet also be allowed to dress comfortably on a hot Shabbos afternoon? Or is this simply an example of how populations change morphology in different habitats, the same way that the trees look different in northern New England than they do down here in Dixie? Anyway, I'd appreciate it if you or your regular commentators would have any answers to my question or coments about the phenomenon. I replied: The answer is that yes, you can be orthodox and dress comfortably in places like Englewood. You couldn't get away with it in Flatbush or Baltimore, but the further into the sticks you go, the more likley it is that you will see it, but let's see what the readership says. Readers? During my disapearance, some of you sent me articles you wanted shared with the broader olam. Links follow, with the hat-tips in parenthesis. 1010 WINS: Woman to Lead Upper West Side Synagogue (Amshi) Krum wrote about this while I was away, and though he didn't give his view, here's mine: YAWN. Overall, I think it's swell that some Orthodox Jews are looking for ways to accomodate women who wish to take on larger community roles. I also think it's swell that some Orthodox women have the ability to lead Orthodox congregations. But this "exciting new development" is 50 years behind the times. We have woman doctors, and lawyers and CEOs. Why not a woman Rabbi, too, if you can make it work in a way that won't offend halacha? And if you don't like it, fine. Having a woman "head of congregation" isn't for everyone, but no one is forcing you to affiliate with Kehilat Orach Eliezer. I keep away from shteebles because I don't like the smell of herring. If you don't like being on the receiving end of a woman's sermon, I advise you to stay clear of KOE. Just don't be like Menken and fall into the trap of denigrating them. Don't say that Kehilat Orach Eliezer is less than Orthodox, so long as they are still shomer kashrus, and shomer shabbos. Police hit out at FBI over leaks (CA) CA adds: Looks like Bush is trying to divert attention from his failures, even if it hampers successful prosecution of the War on Terrorism. Our British allies are not amushed. Cops: Rabbinical student 'moons' crowd (CA) "A student of the Rabbinical College of America was arrested for punching a man, trying to steal his car and then "mooning" onlookers." All together now: No TRUE student of the Rabbinical College of America would punch, steal, moon people, etc. Cross Currents: Is the Democratic Party Going European? (Chardal) I don't read Cross Currents anymore (I couldn't handle the nausea.) But for Chardal I made the effort. This post was unadulterated GOP-propoganda (like most of what CC publishes) that attempts to argue that the Democrats are a bunch of anti-Semites using 5 or 6 annonymous comments which were left on big leftie blogs. This is a little like using the comments on my blog to draw an opinion about the state of Orthodoxy. It's a useful approach only if you have a pre-existing opinion, and no interest in the truth --which is why I am not surprised to see it on Cross Currents. Jameel snuck a post onto the blog during my absence and it's filled with mistakes. Not that I don't love Jameel with my whole heart, but here's the fisking he deserves. Despite DovBear's assertion, one doesn't need to wear blue and white underwear, madly dance on Yom HaAtzmaut, or even hate Arabs to feel a passion for Eretz Yisrael. My actual assertion was this: "I'm missing the intangible passion, the bit of madness that makes people want to rally and march and dance on Yom Haatzmaut. I put Jerusalem before my greatest joy, but not Israel." It said simply that I didn't feel passion in my own heart for Israel, the nation state. I said nothing about Eretz Yisreol, and the remark about blue and white underwear was a joke I used to describe myself. I did not, as Jameel implies, direct the comments about underwear and Arabs at anyone but me. And what would Rabbi Yehuda HaLevi had said about the nation of Israel which was created in 1948? Do you imagine he had the ability to see 900 years into the future and it was Ehud Olmert he longed for? Was he eagerly awaiting a day when most of the Jews in Israel spend Yom Kippur on the beach? Where the most tortured halachic reasoning is used to deny Arabs their homes and their humanity? Rabbi Yehuda HaLevi loved the idea of Eretz Yisroel; the state we have today is a pale reflection. For Zionists like Jameel that's enough. For the Haredim of Brooklyn and Lakewood, it isn't. Rabbi Yehuda HaLevi, I bet, would have been similarly disapointed had he lived to see the creation of Israel. It's interesting to see this symmetry in action over the past month – unquestionably, the fiercest and most dedicated fighters in the IDF emerged from two groups: the members of Kibbutzim and Moshavim, and those from the national-religious community. Unquestionably? What sort of survey instrument did you use to reach this rock-solid conclusion? It sounds swell, and certainly supports your cherished belief, but where's the evidence? Seemingly an odd combination after so many years of being told that "the secular have abandoned the country" – the secular, don't look for me in a shul, even on Yom Kippur, 'cause I'm eating my ham sandwich" kibbutznik, fought shoulder to shoulder in Lebanon with religious, kippa wearing, "don't throw anyone out of Gush Katif orange wrist banded" soldiers. What about the Israelis who are neither entirely secular, nor entirley religious? Don't they exist? Weren't they in Lebanon, too? And again, if you are going to continue to insist that their fighting was neither fierce nor dedicated, I'm going to demand some evidence. It's not nice to belittle their sacrifice simply because it doesn't support your thesis. The homeland of the Jewish people needed defending, and both groups volunteered, with their lives, to protect it. Volunteered? Isn't Israeli military service compulsary? Please don't misuse historical terms on my blog. Manifest Destiny (per Wikipedia) was a phrase that expressed the belief that the United States had a mission to expand, spreading its form of democracy and freedom. The US was not "founded" on Manifest Destiny (the phrase belongs to the 19th century) and Manifest Destiny was not rooted in religion. It's hard to even argue that it was an expression of faith. Anyway, who says it was valid? It's easy to find historians who object to Manifest Destiny on the exact same grounds that XGH uses to object to Israeli expansion. Two wrongs don't make a right, Jameel. Eretz Yisrael offers something else, a connection to our past and future which was missing in the US... blah... blah blah blah... blah. Very good. You've explained why you feel passion for Israel. And because you're a good writer and I'm in possesion of a decent imagination I can emphasize with your reasons, and understand your point of view. But these reasons are still your reasons, not mine. And as an argument they aren't very convincing. DovBear is back. Tell your friends. More later. Meantime, start saying good-bye to the guest bloggers. It's understandable that after 2000 years of exile this passionate spark is slightly dampened in so many. Where should it, where could it emerge from, burning brightly in this day and age to ignite the passion and pathos of "If I forget thee Jerusalem…if I forget you on my day of celebration?" father/son one works best for me. Yet, there are many Jews in Israel and around the world, for which "If I forget three Jerusalem" is still a living part of their daily lives. The posting a few days ago on DovBear's blog, "How Deep is your Faith?" challenged many of us – if the basis for our faith is unproven, then our actions need to be carefully measured when plotting the course of Israel, and a large dose of humility thrown in for good measure. morality and ethics is just as important. attack, our soldiers kidnapped, and the vast majority of us realized inherently that we needed to fight back. Clearly, those soldiers have a passion for Israel, yet from where does the lack of passion for Israel come from? DovBear appreciates Israel, will teach his children Hebrew, and cares about Israel – yet at the end of the day, wants to watch from America. XGH seemingly chides us to be humble in our fight for survival, apparently implying we need to tread lightly when defending ourselves [or building the land] as we end up "land grabbing", "occupying another people" and "bombing the Lebanese" based on an unproven faith, that we believe we should live in Israel. After all, how are we any different from Hizbolla? Yet our quest to live in Israel, based on our faith, is no less valid a right than the existence of the United States through the principle of Manifest Destinty which founded the US. To even question a Jew's right to live in Israel and defend himself – while writing from the United States which was built upon the foundations of Manifest Destiny is to blatantly ignore history, and might I add, rather haughty and audacious. Or more succinctly, the pot calling the kettle black. Passion for Israel is not necessarily rooted in nationalism…or blue and white…or kibbutz socialism… Personally, when I spent my first year in Yeshiva in Israel, I didn't have "the passion" at all. Yet, by the end of the year, a quick poll in my yeshiva showed that 99% of those who came for the year would be interested in staying…in some sort of framework…many even permanently. States in a frum community that catered nicely to an Orthodox lifestyle: good Jewish schooling, Kosher food, an eruv (agreed to by most), shuls, a mikva, and a suburban surrounding of grass, trees, culture and little league – yet after a year in Israel, the US and my community lost it's appeal. help, to serve, to distribute food was without a doubt, one of our finest moments as a country. That politics and differences could be put aside for a common goal was heart warming. It may not exist for everyone, but the longing for Israel, the passion for Zion is bound up within the spiritualiy of Judiasm. It's there – so many people felt it over the past month – impossible to explain, but I would bet dollars to donuts that many, many of you reading this posting, know exactly what I'm writing about. XGH and DovBear may scoff and dismiss this posting – it's unscientific, not provable, maybe even G-d forbid just the messianic rantings of a fanatical settler. P&T hate PETA. Agree or Disagree? Discuss. This video was made PETA. The same people who value the lives of animals over the lives of humans. My oldest daughter recently turned eleven and suddenly all anyone seems to want to talk about is her bas-mitzva. Of course no one wants to talk about the important things like what it actually MEANS to be of Jewish legal age. Will she be taking on more chessed activities? More learning? How do I think she will fast on her first Yom Kippur? No no, they want to know what I'm "DOING" for her bas-mitzva by which they mean what kind of lavish gala will we be hosting to commemorate this blessed event. Well, I DON'T KNOW, OK?!! 5) An accumulation of debt that would prevent me from sending my freshly minted "adult" child to attend yeshiva HS. 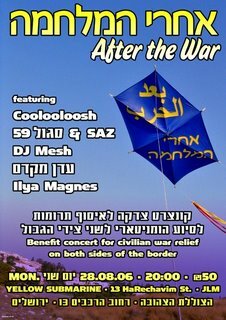 People keep telling me "what is expected" - a weekend of meals for family and friends, a big kiddush in shul, and some kind of party the following Sunday with live music and dancing and that's considered the basics. I need to figure out how to do this quickly without breaking the bank, or ending up in emergency room and I think the first step is to stop caring about what other people think. Translation: Come! Let us sing to Hashem, let us call out to the Rock of our salvation. My kavanah: Well okay! So far so good, I’m feeling a bit uplifted. Salvation is good, the ‘rock’ thing is a bit antiquated, but nu, I can live with that. Hebrew: Nekadmah fanav besodah, bizmiros nariah lo. Translation: Let us greet him with thanksgiving, with praiseful songs let us call out to him. My kavanah: Okay, that’s not bad. Let’s carry on. Kavanah: Hmm, that word ‘El’. I seem to recall some heretical things about that one. Oh well, try not to think about that, keep up with the kavanah, let’s go! Hebrew: umelech godol al kol Elohim. My Kavanah: Whoa! Hold on a second! Over all the other gods? Oh no, is this monolatry? What the heck? Quick, what does Artscroll say: Elohim: Heavenly Powers. Yeah, that figures, typical Artscroll. And it was down hill from there. Oh well. Join me next week as I try this with 'Sholom Aleychem'. Hahaha. Very funny. Problem is, R' Menken is playing with words here. Not that the Times' description of KOE would be determinative of KOE's fidelity to halakha, but the term "closely" in this context is obviously being used in the sense of strict or rigorous (see here) rather than close but "not all the way there." And what is the proof that KOE is non-halakhic? Nothing. Absolutely nothing. The post goes on to mention the fact that its founder, R' David Weiss Halivni used to be a member of the Conservative movement but left the movement when it began to ordain women, and then founded UTJ, which, according to the post, "claims to 'support and encourage traditional Jewish practice among individuals, congregations, institutions, scholars and religious leaders across the spectrum of the Jewish community,' and says that 'our goal is to bring the greatest possible number of Jews closer to an open-minded, observant Jewish life.'" Um...what was the question? The post then notes that KOE is (gasp!) not affilliated with the "Orthodox Union (much less Young Israel or Agudath Israel)," a description that applies to probably 50% of the Orthodox shuls I know, but that it "might find itself affiliating with the UTJ." Yes. And Cross-Currents might be affilliated with the Catholic Church. Problem is, KOE appears to have no formal affiliation with any Jewish group, including UTJ, despite R' Menken's wishes that it "might" be the case.